Please join me for some Shortbread Tea Bag Cookies that Cissy was able to bring home from our Evening Tea Party last week. Aren't they the sweetest looking cookies? My teapot and cup stack was given to me from a dear, sweet neighbor. Isn't it so cute? It's perfect for Spring! 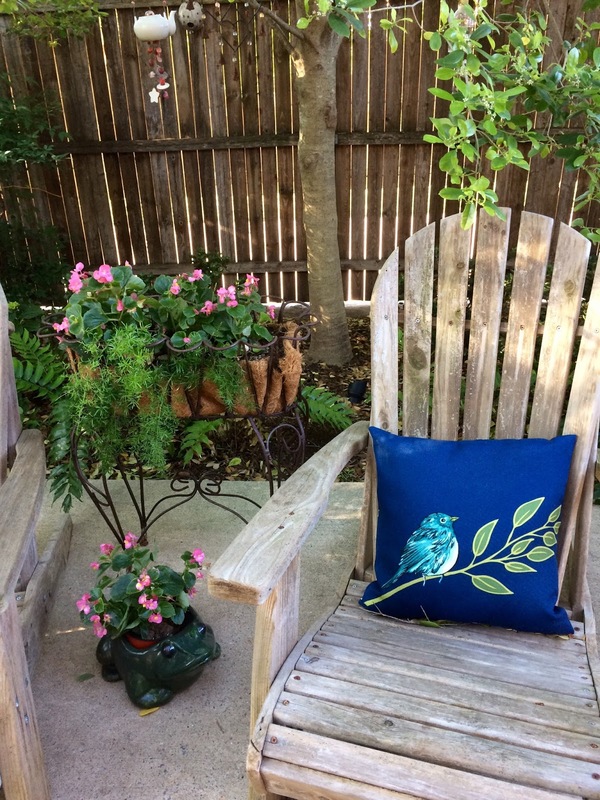 I found two of these birdie pillows for my Adirondack chairs and they add a touch of brightness to my patio. 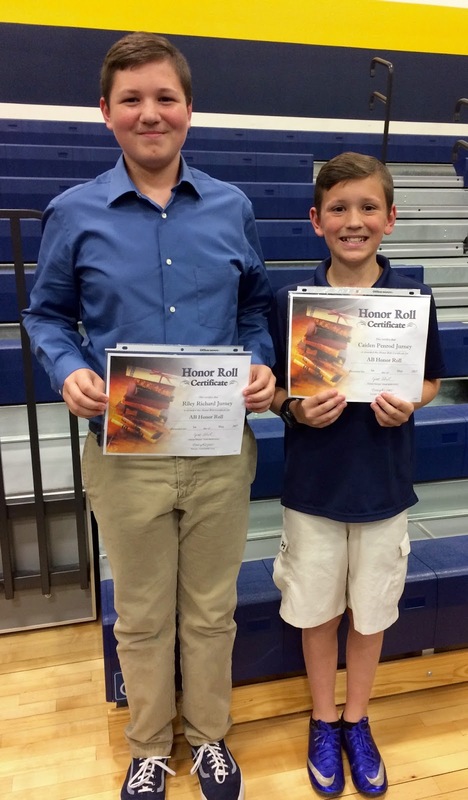 This past week, I was privileged to be able to attend the Honor Roll program at the middle school for these two, sweet grandsons. My granddaughter, Cissy, and I had these at the Evening Tea Party that we were invited to. I bought the recipe cards that they had for sale, and this recipe was included. The ladies at the church put herbs in the cookies, but the recipe didn't include that ingredient. You will also need: a straw or skewer to make a hole in the cookie, kitchen twine or string, custom tea bag tags. Place the butter and flour in food processor, and pulse until you have a sandy mixture. Transfer the mixture to a large bowl, add powdered sugar, egg, vanilla, and salt. Mix with your hands and then turn the mixture onto a work surface and knead until a smooth dough forms. Wrap the dough with cling wrap and refrigerate for 30 minutes. Place chilled dough on parchment paper, lightly dust with flour , then roll it out to about 1/4" thickness. Lay a tea bag on the dough for measurement, and cut out rectangles using a knife. Again using the tea bag for measurement, cut the tops to give the rectangles a tea bag shape. Poke a hold at the top with a skewer or straw. Refrigerate cut cookies for 30 minutes while preheating the oven to 350 degrees. Bake for 11-12 minutes or until slightly golden. Allow to cool to room temperature. Put the dark chocolate in microwavable dish and melt, using 30 second intervals, stirring frequently. Dip the tea bag cookies halfway in the melted chocolate and place them on a cookie sheet lined with parchment. Refrigerate for 10-15 minutes, until chocolate hardens. Cut strin about 9" long and thread through the hold in cookie. Use glue stick to cover the blank side of your tea bag tag, place string in middle and fold tag in half, securing the thread ends inside. Enjoy these cute tea bag cookies! Enjoyed this post and love the tea-cup and tea-pot duo. So adorable. Congrats to the grands! Those cookies are the cutest things! And if you make them, they must be tasty. Congratulations to your two grandsons, how wonderful! Those cookies are darling, Kitty. I will be hosting a Mother Daughter Tea tomorrow for my two girls, sure am praying that Stephanie is feeling better by then. Congrats to your handsome grandsons. The teabag cookies are so cute. I love the chocolate dip on them. I'm sure they were yummy. I've seen these tea bag cookies on Pinterest and think they are the cutest things! Look like they taste really good too. Congrats to your two grandsons. And your teapot and new pillow are so pretty. I am looking forward to sitting on my deck one of these days. We actually had frost warnings last night! A warmish winter, but a cold spring this year. Very cute! I have pinned these to my "Time for Tea" Pinterest board. They look delicious as well as pretty. Hi Kitty, Aren't these cookies the cutest?!? They looks delicious! Love them and thank you for sharing the recipe. Your garden is so pretty all set for tea and your darling teapot cup is beautiful. What a special neighbor gift. Love the pillows on your chairs too. Just look at your handsome grandsons. Congrats to them on their honor roll achievements. Your post is just oozing with cuteness from the sweet teabag cookies to the adorable bird tea-for-one set to your studious grandsons (congrats on making the honour rolls!). When you mentioned the herbal teabag cookies last week, I thought the cookies were infused with herbal tea. Whoops! Now I get why Cissy wasn't a fan...I like your version with chocolate better! Such cute teabag cookies and they sound good too. 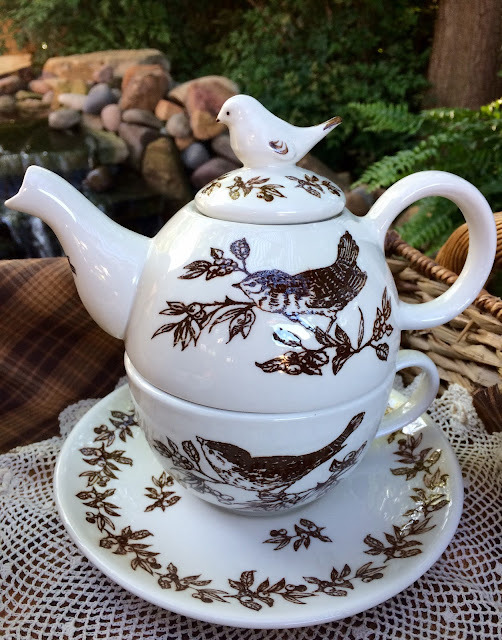 I love your teapot with the birds and your cute new bird pillow. 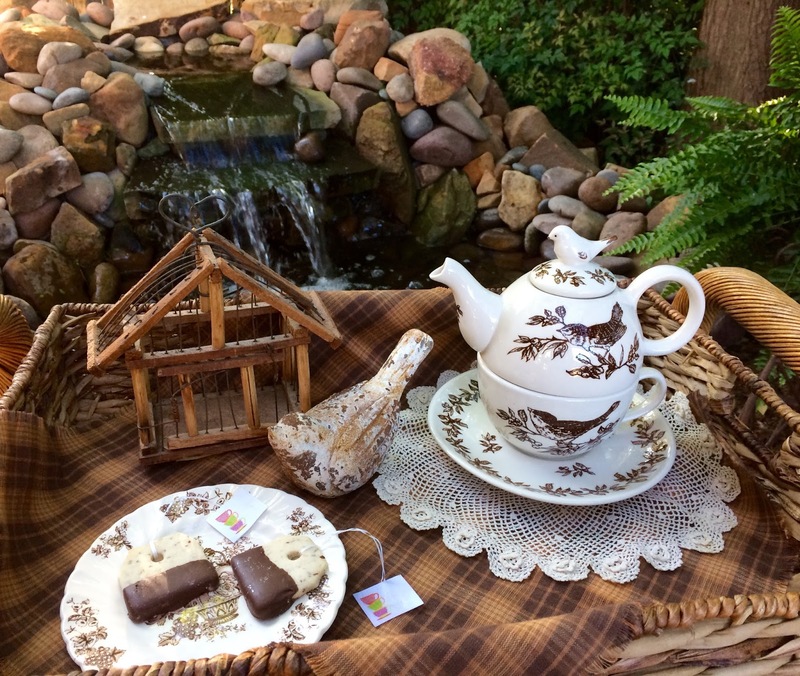 I can hear the sound of soothing running water from your fountain as you sip your tea and enjoy tasting the cute cookies. Congrats to the boys on the honor roll. Well if that doesn't beat all? What an adorable idea...perfect for a woman like you who loves teas and teacups. I love it!!! Oh, MY! These sound wonderful!!! Thank you so much for sharing! I love the pretty pillows, too. :) God bless you, sweet friend. Those cookies are really cute and that teapot is adorable! Darling pillow too. The cookies look both decorative and delicious. The bird teapot and cup, and the pillow are very springlike. Congratulations to your two handsome grandsons! How nice that you were able to attend the boy's Honor awards! Smart guys...and CUTE, too! Thank you for taking the time to type out the recipe for those darling teabag shaped cookies, Kitty. I have saved it & hope to make some for quilting friends this summer. Your teapot and cup stack is just lovely!! What a nice gift idea! I only have a couple of that style & I cherish them because they came from friends. I think of them every time I get them out, too. Oh, if these cookies taste as good as they look, they wouldn't be around very long (isn't that true for most cookies, LOL?) I love the darling teapot too....and I know how proud you are of those grand boys of yours! Love your post! Beautiful teapot! I remember pinning teabag cookies a couple of years ago but never got around to making them. So sweet, as are your tags. The tea-for-one set is perfect for spring and the bird theme. Your tea-for-one set is just too cute! I love the sweet little bird on top! Hi Kitty, those are really cute looking teabag cookies! Thanks for sharing the recipe to make them at C&C with J&J. Enjoy the week and have a Happy Mother's Day. Those cookies are just about the most adorable tea-related food I've seen. thanks for letting us peek and giving us the recipe. What a wonderful recipe you have shared today with those delicious cookies Kitty.those are super cute with tea! I always love seeing the Grands there and seeing the life you are enjoying with them. Thank you for sharing and linking. That's a darling tea for one too! Thank you for sharing your recipe. Congrats to the handsome grandsons! Congratulations to your handsome grandsons Kitty! Your cookies are adorable, and dipping in chocolate is a must. I hope you are enjoying the week. Happy Mother's Day! Awww, congrats to your sweet grandsons. Love the teapot. It is darling and so perfect for spring. 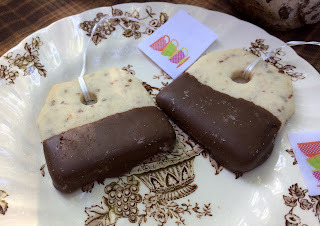 The shortbread cookies must be a big hit, dipped in chocolate. happy Mother's day sweet Kitty. Those teabag cookies are so adorable and they would be perfect for a tea party. What fun to spend time with your grandchildren. Love the birdie tea-for-one pot too. Happy Mother's Day weekend, dear friend. Kitty, sweet post! Love your grands! Congrats to these two. I'm going to pass the cookie recipe along to my friend who loves making cutout cookies of all sorts and would just love these. Not sure how I missed this post. Glad I happened to see it on my sidebar. Those cookies are adorable. Love the birdie pillows and the teapot stack. Happy Mother's Day, sweet friend. These are the cutest tea cookies ever Kitty! Just adorable! Thanks for sharing this at the Dishing It & Digging It Link Party. Hope you have a great week. I just pinned your awesome Tea Bag Shortbread Cookies! Hope you are having a fantastic week and thanks so much for sharing with us at Full Plate Thursday. We will look forward to seeing you again real soon! I love shortbread cookies, and this is such a clever idea!! Your tray looks so pretty with the teapot for one and the coordinating plate. Your garden always looks so pretty too -- such a peaceful place to relax and enjoy a cup of tea. Thanks for sharing this recipe with us and have a wonderful week! P.S. Congrats to your precious grandsons! !